Spot the nearest AED… you could save someone’s life! Did you know there are 56 automated external defibrillators (AED) across McGill’s two campuses? An AED is a portable device that checks the heart rhythm and can send an electric shock to the heart in case of irregular heartbeat or cardiac arrest. There have been three instances on McGill campuses where AEDs have saved lives. There are 56 automated external defibrillators across McGill. The one pictured here is located on the 3rd floor of the James Building, across from the elevators. Did you know there are 56 automated external defibrillators (AED) across McGill’s two campuses? AEDs are used when someone’s heart goes into what is called fibrillation, which consists of rapid irregular contractions of the heart muscle fibers that result in a lack of synchronism between the person’s heartbeat and pulse. This can cause blood to stop flowing and lead to sudden cardiac arrest. An AED is a portable device that checks the heart rhythm and can send an electric shock to the heart to try to restore a normal rhythm or, in the case of cardiac arrest, get the heart beating again. 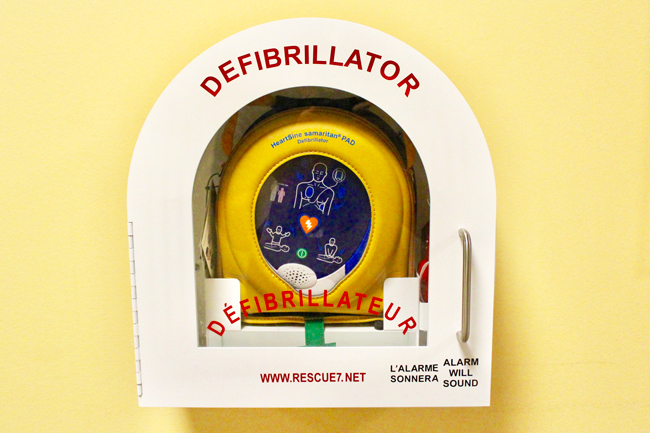 There have been three instances on McGill campuses where AEDs have saved lives. The University decided to install them campus wide in 2011 (they were previously only available in Security Services patrol cars and in some locations with higher risks of cardiac events, such as sports facilities). “These devices save lives. When it comes to return on investment, it’s pretty hard to beat that,” says Wayne Wood, Director of Environmental Health and Safety at McGill. Units are not available in each building, but have been spread out so anyone on either campus is able to go get one and return to assist the person in need within three to four minutes. Though Environmental Health and Safety (EHS) recommends that community members take the two-day First Aid course the unit offers, which includes AED training, the devices are easy to use. “It essentially tells the user what to do,” says Kathryn Wiens, Occupational Health Program Administrator at EHS. “It monitors the heart rate and will only tell the user to deliver an electric shock if it has assessed that one is needed.” It may instruct the user to perform chest compressions so freshly oxygenated blood can circulate again. Additionally, all of the units at McGill are linked to the University’s Security Services. 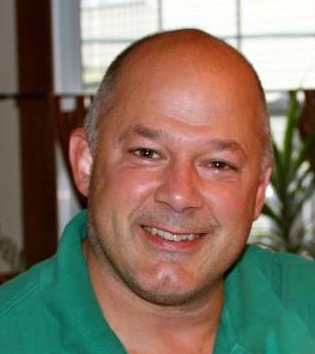 “If someone opens the door of an AED box, Security Services gets notified and an agent is deployed,” Wiens adds. All security agents are trained in first aid. The list of locations where the 56 devices are available can be found online. All members of the McGill community are encouraged to locate those nearest to their regular places of work or study. A video demonstrating how to use the AED device can be viewed below.